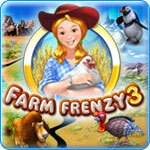 Farm Frenzy 3 Game Review - Download and Play Free Version! Raise Exotic Animals on Farms All Over the World! Sharp 3D graphics make it visually appealing. Unique premise and theme, distinct from other games. Variety of goals in each level offer multiple things to work towards in each level. Trophy room displaying trophies earned for various achievements. Reaching level goals is rewarded with the ability to upgrade equipment. Storyline is disjointed from game and lacks explanation/background. Difficulty is inconsistent and requires strategic planning prior to play. Forced to buy specific upgrades each level, almost impossible to customize your upgrades. When the farmers union treats her friends unjustly, Scarlett decides to personally help them run their farms in Africa, South America and other exotic locations. Help her manage five farms, run for president of the farmers union and even breed penguins! 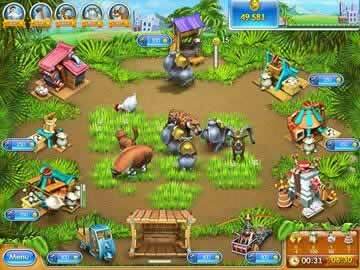 This game is the fourth installment in the Farm Frenzy series but it can be played alone for an exciting farming adventure that will take you all around the world. Care for Animals and Bake Products as Fast as You Can! Get ready for fast-paced planning and tons of clicking in this time management game! Feed animals, like guinea hens, to earn products like eggs. Use the eggs to make egg powder, which, for example, can be used in the cookie-making machine to make cookies. For each level, you are given a set of goals, such as owning six hens, making 12 bags of egg powder and having $1,000. You'll also be given a small time limit and you must complete all goals in that time limit to earn a gold medal for that level. Between levels, you can buy upgrades like an egg incubator, a better truck to sell your products at the market and better traps to catch wild animals that threaten your animals. Some upgrades are mandatory to advance to the next level, so you might have to replay previous levels to get gold medals and more money. This is a challenging time management game because you have to develop strategies to shave just a few seconds off your time and win that gold medal to advance. You'll find yourself playing some levels over and over again to perfect your strategy, but with such addicting gameplay you'll be having fun the whole time! Head to the farm now and test your time management skills in Farm Frenzy 3! Farm Frenzy 3 is an entirely unique spin on traditional task-management games. As Scarlet, a young farmer, you must travel the world, helping your other farmer friends in their time of need. Utilizing only the mouse, you must feed/water your animals, pump water, gather raw materials and use them to make products you can sell. The farming theme is completely unique and offers a different style of play than typical games of the same genre, while remaining true to the expectations of the task-management game fan. Scarlet is asked to assist her five friends on their farms, which are located all over the world. The storyline is supposed to make you feel sympathetic for Scarlet's friends because their farms are going under and the FUN won't help them. The FUN is the Farmer's Union Nod, which is a pretty ridiculous name, in addition to being part of the disjointed storyline. Rather than explain what the FUN is and why you are supposed to care about it, the game skips over that entirely, jumping in and out with the story when you have completed helping each farm. The end goal is to become president of the FUN by getting the votes of all the farmers you help, but that isn't made clear until about halfway through the game. This kind of disregard for the storyline isn't necessarily a huge flaw, but there are elements which really detract from the overall quality of the game. The president of FUN makes several sexist comments, and the looks of the characters are almost as stereotypical as possible. However, the graphics are 3D and quite well done, so if you can ignore the storyline and focus on the look of the farms, you will have more fun playing. There are about 20 levels at each farm, making beating the game anything but a quick process. Each farm is in a different climate, so the animals used are different at each farm. Some animals produce items, like eggs and milk, that can either be sold individually or put into a machine to create another product. Cow's milk is worth much more than eggs, so buying a cow costs more gold than buying a chicken, and so forth for the rest of the animals. You can buy more animals at any point during each level, as long as you have enough money. All the products you have are kept in the warehouse and must be driven to market in your truck, both of which can only hold a specific amount of items. This means you must constantly be aware of how much is in your warehouse and when is a good time to sell some things, which adds another element of diversity and difficulty to the game. This prevents Farm Frenzy 3 from becoming repetitive and tedious, because there is so much to do and pay attention to. There are a variety of goals to achieve. Most relevant are the time goals. A gold trophy can be earned if you complete the level within the shortest time slot, a silver trophy for a slightly longer time slot, and a check mark for just getting through the level. Stars are given for completing the level, and a star bonus is possible for getting a silver or gold trophy. These stars are used to buy upgrades for your equipment in between levels. Unfortunately, this system is not rewarding at all, because you are forced to upgrade specific things before you can begin each level. Usually the required upgrades use up the exact amount of stars you earned for just completing the level, so it is almost impossible to customize your upgrades unless you get gold trophies on every level. Equally disappointing is the way the upgrades are given to you. Upgrades are not immediately applied to your equipment; instead, you have to pay during the level to use the upgrades you have just purchased. Basically, you are using your stars to buy the ability to upgrade your equipment during the level, rather than just buying the upgrades. People who enjoy instantly seeing the rewards of their efforts will probably find this annoying. Those who like to show off their gaming prowess will enjoy the addition of the “Trophy Room” to Farm Frenzy 3. You are awarded different trophies for unique achievements, which can either have something to do with the rest of the game or not. You earn one for finishing a level in record time, for gathering seven products before the hit the ground, and one each for each farm you complete. These have no use other than to look at them, although the empty spaces in the Trophy Room show you what is required to earn the trophies you haven't gotten yet. This offers the player something else to strive for, especially in light of the disappointing upgrade system and the inconsistency of level difficulty. It is impossible to fail a level, because it allows you to keep playing until you get all of the products you need, no matter how long it takes. This would seem to make the game easy. By contrast, winning the gold trophies is virtually impossible on most levels, and the silvers are very nearly as hard to win. This makes the game unappealing, because it seems like you are always just mediocre at it. It isn't a challenge to pass the levels (because you can't fail them), but doing anything better than that is frustratingly impossible at times. Farm Frenzy 3 tries to offer a unique game with enough variety to avoid being boring and repetitive, which is the curse of task-management games. Unfortunately, the average player can usually do no better than just pass the levels, the upgrade system barely allows you to upgrade anything, and the sometimes-non-existent storyline really detracts from the feel of the game itself. This game is worth a play-through, but there are much, much better task-management games out there. View some footage from an early level and see a few of the unique animals and production equipment found in Farm Frenzy 3.